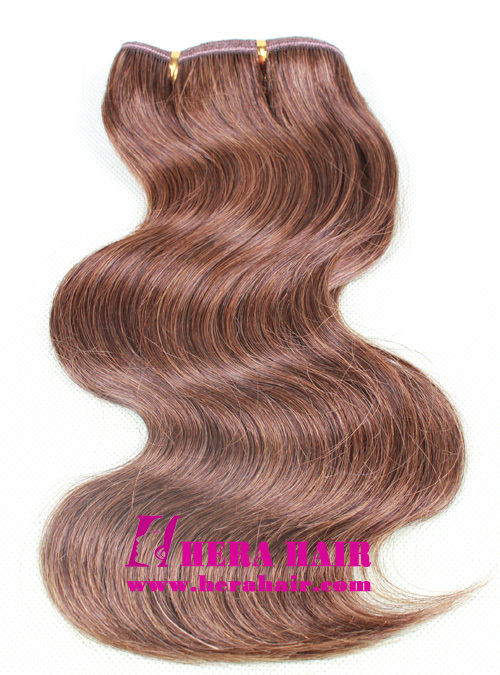 Hera are the best cheap body wave machined human hair weave extensions manufactuer,supplier and wholesaler in China. The pictured wavy hair weaves extensions is 12 inches body wave 50% #2 mixed 50% #6 machined Brazilian virgin hair wefts. Hera noly only supply single color Brazilian machined hair wefts, but also supply different percentage color mixed Brazilian machined hair wefts, such as 30% mix 70%, 20% mix 80% etc according to your requirement to get fantastic color effects. If you are personal BW Brazilian hair wefts buyer or hair stylist, hair salon owner to buy several packs for your clients, you could visit our online Hera Hair Extension Store, which is free shipping to worldwide and you can pay by Paypal. No matter you want to wholesale Brazilian hair weave extensions or want to enquiry about Hera's hair weave extensions, we recommend you contact us by Email, which email could describe your order details very clearly and we can tractk the records in future.